NORTHAMPTON, UK, and ATLANTA (Feb. 6, 2018) – Retail executives from around the world converged in New York City Jan. 14-16 for the National Retail Federation’s (NRF) BIG Show. The retail industry’s premier showcase, executives attend NRF every year to find solutions that will improve store performance and ultimately increase company-wide sales. At the show, Irisys held an interactive survey to identify what performance areas retailers are relying on analytics to help them reach their goals. The responses from the 160 participants of the “Retail Operations Wish List” survey were clear – better customer conversion is the top priority. More than 52 percent of the those surveyed said they need a retail analytics solution to help them increase conversion ratios. These results confirm our 2017 NRF survey results where more than 47 percent of the 192-surveyed last year stated the same needs. 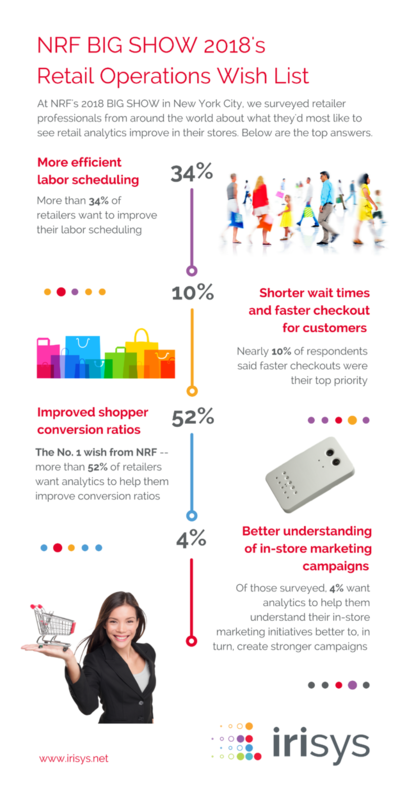 Not far behind conversion, more than 34 percent of respondents said more efficient labor scheduling is the highest value retail analytics can provide their in-store operations. This is yet another year-over-year validation as more than 32 percent of 2017 participants believed the same. “Vector 4D with Estate Manager Plus (EM+), developed by Irisys and showcased at NRF’s BIG Show, is the most advanced technology platform on the people counting market today and further improves the accuracy and expands the capabilities in how footfall data is collected,” says Hughes.